Do you need to know how to deal with depression? For yourself or for someone you care about? Zehhu is the component program of the Hashi Mashi plan, which focuses on helping a person navigate a number of serious issues; depression, loss, trauma, estrangement, career loss, divorce, rejection and/or abandonment. Any circumstance that can turn your life upside down and damage your mental and physical health((https://www.webmd.com/depression/guide/untreated-depression-effects)). The purpose of Zehhu is to help you to address these issues of depression in order to help you live a better life. 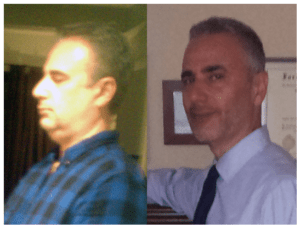 To coach you how to lose weight and how to get fitter in mind and body, no matter what your age, even if you are over 40 or 50. 1) Commitment to change, saying you have had enough of your current condition and deciding to do what it takes to improve every day. 2) Learning how to live a better life every day from observing nature. 3) Nutrition and exercise science that we can make use of to improve our mental health. So what can Zehhu contribute to Help Depression? This is not a site that is only about weight loss, even though the NY Times labeled Hashi Mashi as a weight loss blog. While Hashi Mashi is a focused diet plan & progressive training program to alleviate obesity, Zehhu is focused on alleviating depression. Depression is an invisible illness that saps energy, strength, motivation, and even life, from the depressed and their friends and family. There is societal shame in being fat, but obesity is so common that there is also much acceptance. Depression on the other hand is seen as a great weakness and many people, especially men will hide or ignore their symptoms until it is too late and they are found at the bottom of the east river. Our society needs a life transformation plan for people who are struggling in secret, who are in pain and do not know how to deal with depression. As well as for people who have thought about ending their life so that they can stop the mental pain. We need strategies how to change our thoughts so that we can learn how to cope with depression which can leave our lives charred to a crisp. The goal of is to help those people who have not yet given up and even those who have, help you get back into the game of life. Forget about appearances, if you are reading this, then you are still alive and you still have the opportunity to change your life. You can learn how to deal with depression and build a different life, a better life than the one that has you marinating in depressive thoughts. Let's not set the wrong expectation, even though you cannot cure depression, you can learn how to deal with depression so you can get back into the game of life. You can once again begin to dream and think of what you want to build in the world with your life, whether it be a home for yourself or a home for homeless children. You can get out of your head that has steeped in depression for so many years and start to become a member of society once again. Medications cannot always cut it, some people have been on antidepressants for years and even lose their livelihood because of the negative side effects of antidepressants like insomnia, dry mouth, sweating, hallucinations and the big killer of them all, suicidal ideation which leads to actual suicide. Maybe you are here because you want to know how to deal with depression and you are frustrated from taking meds which have negative side effects and you feel yourself going lower and lower. Or because you are overweight or obese and you feel both fat and depressed. Maybe you are here because you are estranged from your children or family and feel like you have been hit by a freight train and have no life left in you. Or because you are going through or have just gone through divorce and you feel like your life is over. There are many people who struggle to put their lives back together after divorce. Especially men after divorce, who more often than not, no longer live in their marital home. Men after divorce, more often than not, no longer see their children on a daily basis. A divorced man has financial obligations, but might rarely feel how much his children need him. Or you are here because you are just plain depressed do not believe that there can be a path outside of medications. My dream is to see a revolution in the field of depression. The next time a person who is struggling with depression goes to their doctor, the prescription will be diet and exercise first, and never antidepressants first. Antidepressants like Zoloft, Prozac, Risperdal, Wellbutrin, and Neurontin have their place for individuals where they are effective, but what about people who have treatment resistant depression? We cannot just tell them to have a nice day with no other program to teach them how to deal with their depression. Maybe you just want to wake up one day and instead of having a mirror hallucination and hearing your reflection speak to you and say “You don't matter, you are not real, you do not exist, why don't you just jump?”. Instead you prefer to wake up with motivation to live this new day of your life as productively as possible, to be the best version of yourself that you can, to be kind to yourself and take care of yourself by nourishing yourself with the best food, exercise, thought, speech and action. The goal of Zehhu is to inspire you to get moving and start taking positive actions that can help us to heal our lives from the inside out. This means a new way of thinking, speaking and acting in order to make your mental health a priority in your life. To motivate you even if you have been living in the dark room of depression for decades. I believe in you and I believe that you can find a way how to deal with your depression so that you can get back into the game of life and transform emptiness into a richer more productive life. These tools of Zehhu, are everything that I have learned facing the challenge of how to deal with depression. I do not claim to have cured my depression. I am still learning. But, despite suffering from treatment-resistant depression, I have alternative options for you to cope with depression. If you do not know the essential habits and tools to take care of yourself, you are not going to be much use to anyone else, so take care of yourself, and do it daily. Because if you just figure you will take care of yourself once a month, that will not cut it. Take care of you every day so that every day you eat better, move a little bit more, sleep a little better and before you know it you will be looking and feeling better. I want you to know that even though you feel like you are alone, you are not alone. Many people who suffer from depression, have no clue how to deal with depression, other than using antidepressants. While overweight people can still party with the crowd, someone in depression is going to avoid the crowd and prefer isolation. Depression is a lonely and isolating disease, but I want you to know that you are not alone. Small changes in your daily thoughts, speech, habits and actions can lead to bigger changes if not transformation. I have been trying to figure out how to deal with depression as long as I can remember. I will not go into the root causes of my depression since every person has their own story and genetic makeup. The bottom line is that depression existed in my life for many years until it finally exploded to such a degree that my entire life turned upside down and my entire sense of identity was shaken to the core. Eventually after many variations of antidepressant cocktails for many years that wreaked havoc in my life because of bad side effects, my doctors advised that I have treatment-resistant depression. So what are the treatment-resistant depression options, if any? After the mirror hallucination I mentioned above, I spoke to a social worker who suggested diet and exercise. Diet and exercise for depression I thought? That sentence did not compute for me. Yes, I have tried diet and exercise for years in order to lose weight, but had never thought of diet and exercise for depression. Could diet and exercise help depression? I found it hard to believe that diet and exercise would help depression, but I started to experiment. Ben and Jerry were my best friends back in those days. Their vanilla heath bar crunch did help my depression for an hour or so, but the high quickly evaporated and I was left just fatter and more depressed. I was pretty sure that ice cream and Oreos was not going to be the diet and exercise plan that was needed to deal with depression. For years I tried different diets, sometimes as frequently as a new diet every day or hour and just ended up with total confusion. I was desperate. Can you relate to that desperation to lose weight? I was isolating in my apartment, steeped in depression and saw no hope or bright future. The demons of depression burned me constantly and were breaking my heart so frequently that I did not believe I could go another day. For years I had a recurring nightmare of seeing a man in an elevator that was not moving. When I tapped him on the shoulder he would turn around and I saw what looked like an older version of myself, a heavier man who had no mouth. I always woke up screaming unintelligibly because the image was so frightening. But this time, one evening, was different. This time I was in the elevator which did not move, either up or down, or sideways for that matter. Again the elevator operator was facing away from me and I tapped him on the shoulder. When he turned around, sure enough, he had no mouth. But this time, when I woke up, I woke up screaming – “Zehhu”, after years of not expressing even a single word from seeing that nightmare, I finally woke up screaming an actual word. All other times I awoke screaming nonsense while still lying down. This time I sat up while screaming “Zehhu” and I knew what it meant. I knew that it meant “Enough, I have had enough of not being able to express myself (symbolized by the elevator man who had no mouth) and as a result stagnating in my life and not moving forward (symbolized by the elevator which is built to go up but never went anywhere in this recurring nightmare.) I said this word Zehhu to myself over and over again that day. I knew that it meant that if I had to scream at myself to get some type of productive action, then I will do so, and I did. That evening I went to an all night deli for the best depression treatment I knew of, more junk food, specifically a blueberry muffin and you can be sure that I did not need another blueberry muffin at midnight after a full day of egg sandwiches, pizza, lasagna, cookies, ice cream, chips and spaghetti and meatballs. My stomach was so distended and I could not reach down to tie my shoes, I could not even see my shoes. Sitting in the deli, with a stomach full of food, yet still looking to satisfy craving with a muffin led me to just break down crying to myself. I just did not know what to do. I did not know how my body could handle any more and thought I was just going to burst. I knew Zehhu meant that I had to take some type of action to improve my life. Finally I thought to myself, why not just try to eat real food like vegetables. That idea actually made me wince because I just did not like vegetables or fruit. My favorite ‘food' in the world was an Oreo cookie and outside of Oreos, my next favorite was any ice cream, chip, snickers, Reesee's, pizza, hamburgers. I also decided that I was going to go beyond cutting out Oreos and even cut out anything else made with wheat. Previously I had seen somewhere on the internet that wheat was associated with depression, something I could not imagine possible at the time, but I was desperate and wheat had to go. While I was at it, I also cut out most other grains and of course just about any food that was processed and marketed in a colorful package, all junk food, pretty much I had nothing left to eat or so I thought. What was left? Vegetables, yellow potato, white potato, sweet potato, asparagus, okra, zucchini, broccoli and fruit; mainly blueberries, strawberries, raspberries, grapes, mango, nuts like cashews, almonds and walnuts. I had read that peanuts and beans could also be toxic and I knew that I always got heartburn after eating them, so I cut many of them out too for the most part. I was terrified of eating eggs, meat and fish from years of having been vegan/vegetarian, but I figured that I had to have something with some calories, so if I had to have an egg, so be it, because I did not want to have the frozen veggie burgers because they looked pretty processed to me and they had wheat gluten in them as well. I also kept plain yogurt, red wine and a little dark chocolate once in awhile. I had tried to lose weight for many years, even decades without success. I think it is safe to say that I have read and tried tens if not hundreds of different weight loss plans. It was not until I eliminated processed food and focused on real foods, specifically vegetables and cutting out wheat to see if that would help my depression that I experienced the life changing body transformation of fat practically melting off of my body for ten months until I reached a stable weight. 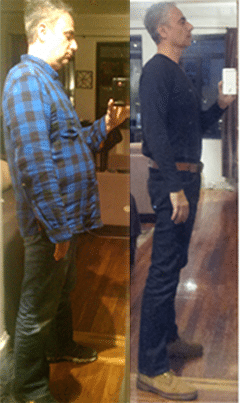 I finally began to see positive changes and they were not just from exercise, because I had been exercising, bike, swimming, walking, machine weights all throughout the years and I was still being called a ‘fat b—–d' because of my inability to lose weight. When I first eliminated wheat, I had no clue how I was going to survive. Everything that I ate in the past was made of wheat and flour, egg sandwich, tuna sandwich, turkey sandwich, pizza, pasta, what did not have wheat or wheat flour? The first meal that I had which was wheat free was a breakfast and instead of having the usual egg sandwich or wrap, I asked the chef of Tudor Cafe to make me a vegetable omelette from eggs, tomato, onion, spinach, mushrooms, pepper, any vegetables that they had. I also asked them to add some hummus, avocado and olives. When the chef asked me what the name of this dish is (actually he called it a mess), I said that I will call it “Hashi Mashi”, just a name I made up because it seemed like such a mish mash, a mixture of ingredients. Ten months later when people in my building and neighborhood did not recognize me, they asked me what I had been doing to lose so much weight, 100 pounds and 18 inches off my waist. I said Hashi Mashi and that is how the name Hashi Mashi was born. The chef put the Hashi Mashi dish on his menu, as more people were asking for it, and that became my nickname. I am not sure which came first. Individuals suffering from depression are more than likely to have experienced job loss and/or divorce((https://www.healthline.com/health/depression/statistics-infographic)).Worldwide, an estimated 120 million people suffer from some form of depression((https://www.healthline.com/health/depression/statistics-infographic)). There are thousands of people who need to know how to deal with depression now, today, immediately. Having a guide how to deal with depression is urgent, a public health crisis, an emergency that must be addressed. In contrast to overweight or obesity, people who are suffering with depression know that they are in a state of emergency but usually do not seek treatment. In fact, over 80 percent of individuals who suffer from depression do not seek treatment((https://www.healthline.com/health/depression/statistics-infographic)). Going to a weight watcher meeting or joining a gym and getting a personal trainer is not a humiliation for most people. Others who know about your determination to lose weight, build muscle, get into shape are inspired by your efforts. On the other hand, going to your shrink or medical doctor to admit that you are depressed and need help is not inspiring to others, instead people will feel sorry for you or even abandon you as if you are contaminated or dangerous to be around. “In 1999 the U.S. Surgeon General labeled stigma as perhaps the biggest barrier to mental health care; this stigma manifests particularly in a phenomenon known as social distancing, whereby people with mental issues are more isolated from others. Eradicating the stigma and social distancing of people with mental illness must be a top public health priority in order to improve worldwide mental health and reduce economic burden. Research suggests that the majority of people hold negative attitudes and stereotypes towards people with mental illness. From a young age children will refer to others as “crazy” or “weird”; these terms are used commonly throughout adulthood as well. Often the negative stereotypes involve perceptions that people with mental illness are dangerous. These negative attitudes often manifest as social distancing with respect to people with mental illness. In particular, when people feel that an individual with mental illness is dangerous, that results in fear and increased social distance. This social distancing may result in the experience of social isolation or loneliness on the part of people with mental illness. So, I figured that after over a decade of struggling with the question of how to deal with depression, there had to be other people out there who are plagued with the same pain of how to deal with depression. I also know from experience that while talk therapy and antidepressants can help, they are not always going to help you get back into the game of life. Sure, it is comforting to have any person empathize with your situation, even if you have to pay them, but the reason that you have to pay for talk therapy is that nobody else wants to hear your problems, everyone has enough of their own. On the antidepressant side, some might help to tranquilize or take away some of your mental pain, but there are others who have treatment resistant depression and antidepressants might be more of a liability than a solution, especially when there are serious negative side effects. Losing your relationships, experiencing isolation, social distancing, estrangements is not a picnic and only increases the pain for you when you are faced with depression. If you feel confused, alienated, silenced by abandonment, lonely and helpless, you are not alone, if you feel paralyzed by your depression, you are not alone. I want to help. The main message of the Hashi Mashi diet and exercise plan for depression and obesity, is to “Change your food, to improve your mood (without meds), and reach your ideal body weight (at the same time. )” If you are suffering with depression, you might think that is impossible. Especially if you have treatment-resistant depression or you have been on medications for many years to no avail. Even if you feel that you are at the end of the rope, there is still hope to take different actions so that you can live a better life. While there might not be a cure for depression, at least you can learn how to deal with depression so you can improve your circumstances. This is the promise of Zehhu, to be a guide for people suffering with depression so that they can live a better life which is going to help improve not only their lives, but that of their wives, children, family and friends. All of the principles of Zehhu will apply to men and women, but are particularly critical for men, because men are the least likely to seek out treatment for depression because of the stigma of depression. Zehhu wil help you focus on stopping your fall into deeper depression by giving you tools of thought, speech and action. Tools of the trade that will help you to eat better, move more and rest more. Over time you will start to heal your body from the inside out and you will have a comprehensive solution for how to deal with depression and get back into the game of life, get fitter, get healthier and live a better life. I am just like you, an average person who is in the same trenches with you – learning how to deal with depression, improve my mental and physical health and life and be the best version of myself possible. If you want to know how to deal with depression, I can help. Or, if you want to end your obesity and lose weight, I can also help. If you want to start feeling better about yourself and improve your life, I can help. Let me help you improve your mood (even without meds), reach your ideal body weight and get fit (all at the same time). This is the basic philosophy of Zehhu in a nutshell. Zehhu is a trigger word which means that you have had enough. Zehhu is the most important and first step in how to deal with depression. You must say that you have had enough of your isolation, depression and/or obesity. You have had enough of being on the sidelines or feeling like you do not even exist at all, you want to get back into the game of life again, you want to be productive again, you want to take the dirt of your life and transform it into a beautiful vineyard. Zehhu means that you stop going down deeper into depression. You stop the descent into deeper depression, and if you have to scream Zehhu at yourself to stop, or any other word in any language, you do it. If you have to say Zehhu over and over to yourself, you do it, you must save yourself from falling into deeper depression, because if you do not, you might not survive a deeper fall. The vineyard is a parable. The vineyard is symbolic of nature teaching us new approaches and perspectives for how to deal with depression. The lessons of the vineyard start with you imagining that you are the owner of a vineyard. Imagine that the vineyard you had built in the past is destroyed. A natural or manmade disaster leveled your vineyard to the point that there is nothing left. You sit in the middle of your field mourning over the loss of your vineyard. The question is, will you continue to sit and mourn, or will you make a decision to rebuild? The choice is yours. If you do choose to rebuild, and reinvent yourself from where you are right now, the following steps are lessons from nature to us on how to go about rebuilding our lives. This site is dedicated to exploring the best practices of how to improve your mood (even without meds), and reach your ideal body weight at the same time. Obviously, it is physically impossible for any one of us to absorb and disseminate the millions of research studies and conclusions that are available on the web, but remember, we are looking for the best nutritional, exercise and thinking strategies that we can employ to help depression and obesity. Let's keep improving every day. Zehhu is a revolution when it comes to dealing with depression and obesity. We are more depressed and obese than ever((https://thinkprogress.org/health/2014/10/02/3575170/depression-rising-americans/)). Clearly, traditional antidepressants and diets are not effective. For this reason, I dedicate my time to doing my best to uncover the best strategies how to deal with depression, as well as obesity. Yes, I want to see a Zehhu revolution, so from now and in the future, well meaning medical professionals will also be aware of the transformative benefits of nutrition, strength training and positive thinking to help their patients deal with depression. With or without medications, for people that react well to antidepressants and for those that suffer with treatment resistant depression, there will be another option, Zehhu, to help those who suffer in silence get back into the game of life. The gold standard for managing most types of depression has been talk therapy and medications for many years if not decades. Let's explore making Zehhu the new gold standard of how to deal with depression.